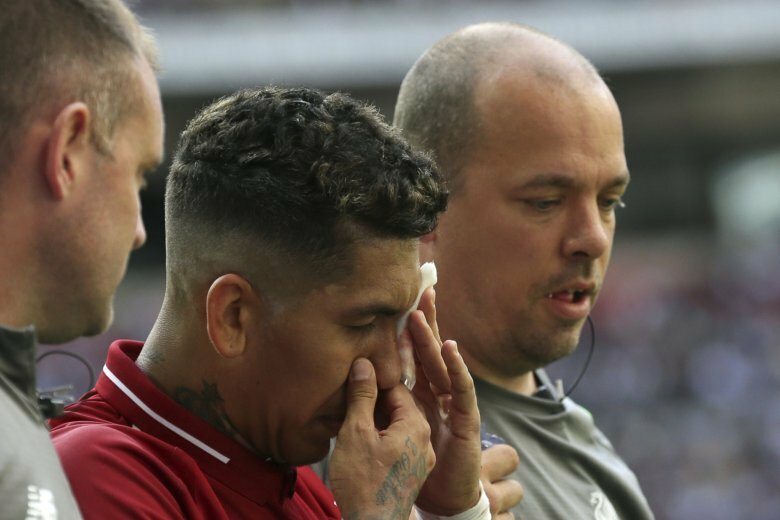 LONDON (AP) — Liverpool forward Roberto Firmino’s left eye was scratched during Saturday’s game at Tottenham and he could miss the Champions League group-stage opener against Paris Saint-Germain. The forward went to a London hospital after the clash with Tottenham defender Jan Vertonghen in the 75th minute of Liverpool’s 2-1 victory at Wembley in the English Premier League. “A hospital examination confirmed an abrasion of the eye, but there will be no lasting damage,” Liverpool said in a statement. Noting a “positive assessment,” Liverpool said Firmino would be “monitored and treated” back in northwest England before any decision is made about whether he can feature at Anfield on Tuesday against PSG. Firmino, who scored his team’s second goal at the start of the second half against Tottenham, had to travel back to Liverpool separately from his teammates. “The players and staff onboard the club flight back to Liverpool sent the Brazilian a video wishing him well,” the team said.